Egusi Soup by Bruntwood award-winning writer, Janice Okoh, opens at Theatre Royal Bury St Edmunds (20-22 February), and then goes on tour to: Key Theatre, Peterborough (24-25 February), artsdepot, North Finchley (5 March), Hull Truck Theatre (7-8 March), Derby Theatre (14 March), Birmingham Repertory Theatre (18-22 March), The Albany, Deptford (25-28 March) and Nottingham Playhouse (4-5 April). Mixing comedy and hard-hitting drama, Egusi Soup is about the Anyias, a British-Nigerian family, who prepare to head home to Lagos for a memorial service in honour of the late Mr Anyia. However, they soon realise they will need to get rid of some excess baggage first, and not just of the material kind. The chaotic return to London from the USA of the Anyias’ eldest daughter disrupts the family equilibrium, and deeply held resentments dramatically resurface. Only time will tell if the family can settle their differences over a nice bowl of egusi soup. 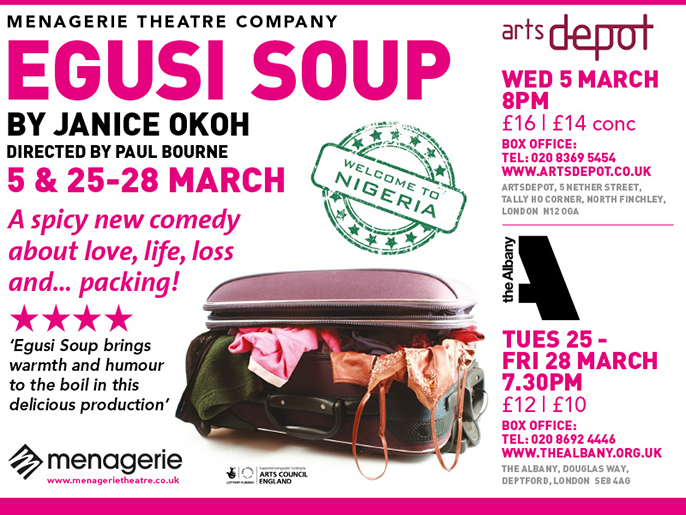 Egusi Soup was produced by Menagerie at Soho Theatre in May 2012 and after popular demand is back to tour the country in Spring 2014. Okoh’s other credits include: short plays for the Royal Court (Open House, 2013), Live Theatre/Soho Theatre (Utopia, June/July 2012), Theatre 503, Islington Community Theatre, Unicorn Theatre and others. In 2011, Janice was the winner of the Bruntwood Award – the most prestigious playwriting award in the UK – for her play Three Birds, which was produced by the Bush Theatre and Manchester Royal Exchange in Feb-Apr 2013. For television, Janice is currently story-lining and writing scripts for Casualty, Doctors, Eastenders and Holby City. Egusi Soup is a co-production between The Theatre Royal Bury St Edmunds and Menagerie Theatre Company. Menagerie is one of the UK’s leading independent new writing theatre companies, seeking out and supporting talented new writers. As well as touring widely, Menagerie curates and produces the annual Hotbed New Writing Theatre Festival in Cambridge. Egusi Soup was first developed at Menagerie’s Sparks programme and then at the Hotbed Festival. Janice Okoh is a Menagerie Associate Writer.